As a blogger, we always have that urge to update status messages, post blog updates and upload pictures immediately or as it happen. Thus staying connected online is one of our obsessions (ganon!?). Free Wifi's may not always be available, not to mention Starbucks no longer provide it free (tsk!) and going to an Internet Cafe might be an issue. So always bring a USB Broadband Dangle with you. Well, I always bring 2 dangles from different providers. 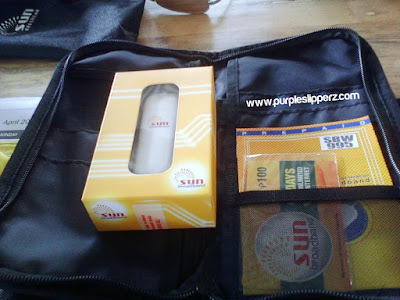 And here's an addition, my Suncellular Prepaid Broadband USB Dangle, which was given by Suncellular as a gift... (oo naman... gift talaga promise). They now have bigger and better coverage in Mindanao. Services in Visayas and Luzon has been excellent and now Mindanao is getting the same service from Suncellular. Sometimes even more. So there will be no dull moments whenever your connected. You can post updates to your blogs, twit with your friends and upload photos in no time, once you have your USB Broadband Dangles with you! What broadband dangle are you using?